Right folks, the sun’s out, the thermometer is rising and it’s right on time for BBQ season! Woohoo! I’ve selected some fabulous recipes to make your barbecue a memorable one: yummy tahini chicken skewers, fingerlicking Southern US BBQ ribs, refreshing cucumber fennel salad with mint and feta and a nicely filling pesto pasta salad. So, no need to linger here and read my blah-di-blah, go on, get out and throw the grill on! Just one note on throwing on the said grill: if you’re like me and have never ever been left to your own devices when it came to grilling, here are some handy tips (which I tested myself, nice, right?!). Make sure you have enough charcoal and firestarters before you start grilling. You need to throw on the grill around one hour before actually grilling. So leave plenty of time (in case the coals don’t catch fire immediately) and get some nice apéritifs in case your guests will have to wait. Right, now to starting your grill. Cover the base with charcoals. Light a firestarter, put it on top of the charcoal and cover with more charcoal, creating a little tower, so that the entire firestarter is covered. Repeat with a second firestarter next to the first mount (and maybe repeat one more time if you have a big barbecue). As soon as you’ve built your mounts, cover the grill and leave the firestarters work their magic for 25 minutes. In theory they should burn out, and meanwhile have light the charcoal, which will start glowing. Well, this doesn’t always happen (in my case I needed 5 attempts! ), but I realized that if you leave the cover on the barbecue for at least 20 minutes after building your mount (peaking in a couple of times to make sure it’s actually catching fire), it does work. Really! It eventually will! Don’t be tempted to run out and get a man to help! We can do this girls! We can be the grillmasters of this universe! Powerrrrr! Peel the cucumber. Cut open lengthwise and remove the watery pips in the middle. Cut the halved cucumber into thin slices. Wash the fennel, cut in half and cut into thin slices. 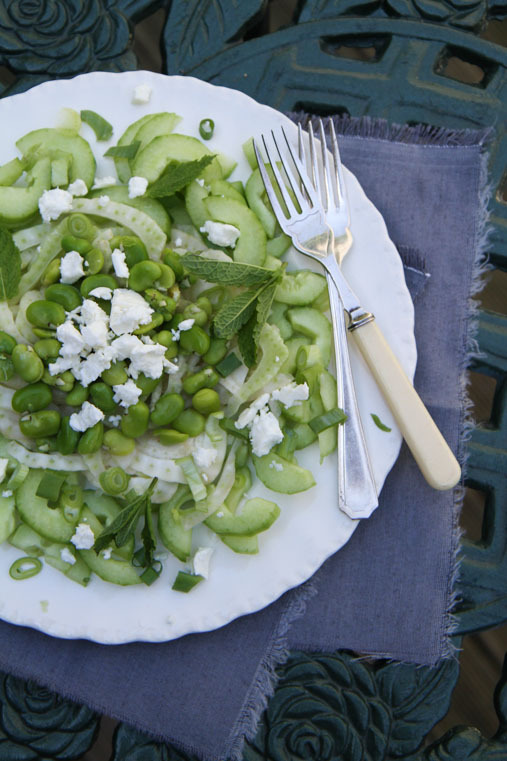 Cook the broad beans, let them cool down (you can shell them if you don’t like the shells). Wash the spring onions and cut into thin slices. Arrange all the vegetables on a large plate. 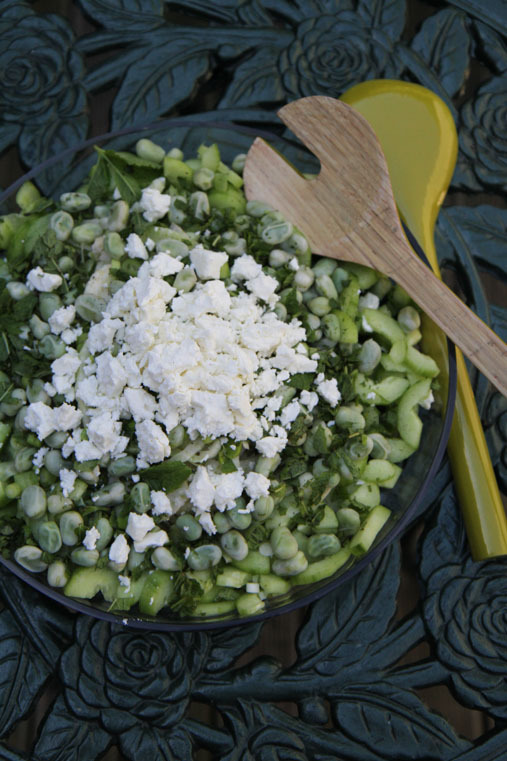 Crumble feta over it. Chop the mint and scatter over the salad, then pour lemon juice and olive oil over the salad and season with salt and pepper. Really nice salad, very easy to make!